After a three-year stint in development, Rime (stylized as RiME) opens with but a whisper. After waking on a deserted beach, you’re confronted with a lush, tropical terrain, with nary a roadmap in sight. You’ve been shipwrecked, it appears, and as the ephemeral day draws upon a curious monolith in the distance, it appears there is more to this crystal-clear island than merely visual appeal. We’ve all seen how protracted development cycles (and oft-coinciding hype) can result in tentative releases, but from its very beginning Tequila Works demonstrate that fans were right to expect something beautiful. Rime is a treasure to look at - even cinematic at points - whose elusive way of storytelling uncovers moments of genuine poignancy. But after a brief nose around each of its isolated districts it becomes evident that Rime’s beauty isn’t always enough to mask its straightforward structure, nor its technical ailments. A brief glance at thatgamecompany’s website will tell you where Rime found its inspiration, and Tequila make sure to acknowledge it visually. The breathy, minimalist design it owes to Journey, while deserted crypts and vaulting monoliths strike a similar feeling of monumentality. There are additional nods in there, such as the various collectible tapestries infused with island history, or silent, becloaked figures that meander alien in the distance. The caped protagonist looks a blend of The Last Guardian’s hero and Ico’s kid-viking, and environments are rife with the windmills, ridgeways and ruins familiar in both games. Despite their flagrancy, these references nevertheless feel magnanimous in terms of the protagonist’s development, while a noticeable concern with light and dark afford Rime’s lamplit passageways and sparkling beaches their own brand of childlike mystery. 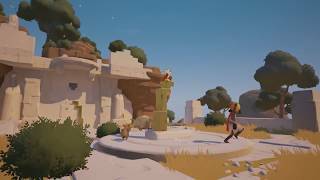 Like Ico, Rime does away with health bars and area maps, leaving players to feel their way around and test the waters for themselves. This demands a bit of exploring to unearth door keys and optional artifacts. Narratively, the game resembles Journey and Ico, in that its half-technological, half-spiritual domains only appear to raise more questions upon further inspection. Majestic half-ruins and mysterious light beams do help chart your odyssey, but their history and purpose (though nudged through visual cues such as wall paintings) remain open to ponder, as does the meaning behind your quest. The lack of in-game map also effects an illusion of breadth; though schools of jellyfish and unclimbable rocks make it clear Rime has its limits, the fact your findings aren’t catalogued on a map never curbs the possibility that some paths remain untrodden. The control scheme is rather loose, however, which can make simple climbing and platforming moments rough and unpredictable, recalling more the onerous leaps of Drake’s Deception, than Ico’s thoughtful trek. Areas themselves, however, are noticeably reined-in, with exploration split across several, self-contained areas, which generally renders puzzles simple after you’ve had a look around. There are very few exceptions, in which the game appears to realize it’s getting too breezy and has you scrabble back and forth between cliff-faces unsure of where to go, but the journey is generally smooth, allowing the game’s filmic qualities to play out at a relaxed, regular pace. The play between light and dark is perhaps the most creative aspect of puzzle design: one moment sees you rotating a sundial to manipulate the shadows, while in others you’re directing will-o-the-wisp-type orbs by shouting at various stone idols. I cracked a smile during both, as my encounters with ancient spirits and specters sent Rime’s semi-spiritual themes clamoring to the surface. The layout nudges the Zelda formula, except without a big boss to defeat. Each realm presents its own conundrum to solve, which usually involves positioning artifacts or manipulating the elements to access keys to the next area. Their simplicity, however, leaves Rime feeling more like a bumpless car journey than orienteering, which can make entering new areas feel unrewarding. You’re even guided through the world by a fox-spirit met early on, who’ll begin to bark at you should you dally for too long in one place. Though charming to watch gambol through the air, they’re essentially a vulpine Navi, serving to point out the ‘correct’ path after deciding it’s had enough. Admittedly this improves with further progression, as the critter begins appearing in odder spots that require a little more observation. While average playthroughs clock in at around five to six hours, depthier excavations easily extend the main game by an hour or two. But once again like Journey, the archaic beauty underlying its visuals remain Rime’s centerpiece, and as an admirer of thatgamecompany’s work perhaps their ability to conjure intensely involving atmospheres made its lack of challenge less problematic for me. Indeed, the lack of an overall problem to solve left smaller puzzles feeling more like a means of uncovering the next spectacle; an opportunity to toy with trinkets and tech, than complex riddles that must be decoded. Hunting for collectibles occasionally offsets the disappointment. Taking alternate or less obvious routes are often rewarded with various collectibles, which’ll allow you to play with different clothing, and expand the game’s story outside the general plot implied through the main game. While it’s easy to stumble across a fair few relics, you’ll often need the full collection to obtain unlockables. There’s a certain degree of replayability here (as well as a bit of a challenge-spike), as some pathways don’t just require eagle-eyed navigation, but to approach each environment in novel ways separate from main puzzles. Unfortunately, Rime’s PC port finds itself continually restricted by technical hitches. While the frame rate blips are relatively minor yet irritatingly regular, the constant texture-glitches caused by moving the in-game camera practically overwhelms some stages. As even simple puzzles and navigation required the camera to be rotated regularly, I found myself unavoidably venturing into generic patches of white, and navigating tightly-spun labyrinths became constantly obstructive due to blinking backgrounds and walls. Sometimes simple commands like changing outfits sends the interface reeling; bringing up the menu caused the sound to cut out a few times, while frequent black screens found me having to reload the last checkpoint, or even restart the game. At one point I was prevented from controlling the camera, leaving me googling an empty screen as my protagonist wandered off-set. As Firewatch bitterly demonstrated on consoles last year, games that pride themselves upon creating an affecting atmosphere are particularly vulnerable to technical issues, and imagining how much more involving Rime’s elusive story might’ve been without those problems is more than a little saddening. It seems console editions offer a slightly smoother experience, but if you intend to play Rime on the PC, I recommend holding out for an update. Some have criticized the not-much-to-it nature of Rime’s fleeting adventure. Its puzzles are usually straightforward, leaving moments of discovery underwhelming, and sometimes the game’s prettiness isn’t enough to save them. When it is, however, its glistening tombs and ancient inventions are imposing, and it’s often when stumbled across that their magic truly sings. In this way, it’s an exercise in curiosity; an innocent peek into coves and caverns merely to see what lurks, and though unoriginal, its vibrant aesthetic and elusive storytelling enchant nonetheless. 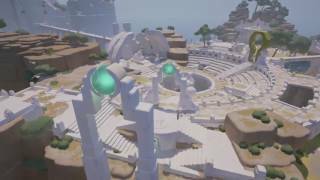 Though undeniably hot for Journey’s sandy regions, Rime’s breathy palette and minimalist design afford its mystical world an appeal both clean and endearing. Meanwhile, a delicate classical soundtrack strikes a thoughtful tone without becoming intrusive. Controls a tad loose, and responsivity problems can make jumping and climbing segments fuddly and primitive. Puzzles often interact creatively with the game’s sparkling visuals, but they’re usually straightforward enough to make cracking them underwhelming. Drawing on tropes familiar to Ico and The Last Guardian, Rime’s semi-spiritual trek carries moments of wide-eyed wonderment, with simplistic puzzle design ensuring a reliably-paced narrative that, while filmic, feels monotonous in places. The proliferation of bugs throughout can stopper its involvement considerably, with frequent black screens, sound issues and camera wonkiness requiring several reboots to rectify. If visual quality is what Tequila Works had in mind, three years have been well spent on fabricating a stylish, truly wondrous environment, despite drawing obviously from previous adventure accolades. It’ll likely underwhelm if approached explicitly as a puzzler, but Rime’s brief tale manages moments of genuine poignancy. The PC port is in dire need of patching, however, if such charm is to survive. Rime is ranked #1206 out of 1434 total reviewed games. It is ranked #137 out of 174 games reviewed in 2017.